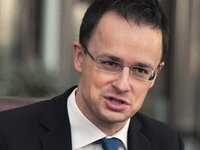 If Ukraine expels the Hungarian consul, Budapest will give a proportionate response, although this could hopefully be avoided, Hungarian Foreign Minister Peter Szijjarto said. Speaking to journalists before leaving for a UN General Assembly session in New York, Szijjarto confirmed that he planned to meet with Ukrainian Foreign Minister Pavlo Klimkin in the United States, the Hungarian publication Origo said. Anti-Hungarian sentiments have lately been growing in Ukraine, which could be attributed to upcoming presidential and parliamentary elections in that country, Szijjarto said. Szijjarto said the events of the past week "went too far" and beyond "all written and unwritten rules of international law and diplomacy," as Ukrainian special services "conducted a special operation at the consulate general of Hungary, a member of NATO." Dual citizenship is common in Europe, and if Ukraine truly wants to move toward the European Union, it should not question this institution, he said. Hungary will continue to take steps to slow down Ukraine's movement toward the EU and NATO, he said. Ukrainian media reported earlier that Hungary issued its passports to Ukrainian citizens at its consulate in Berehove, the Zakarpattia (Trans-Carpathian) region. The reports included a video in which the new Hungarian citizens took the oath of allegiance. Klimkin said he would discuss the issue with Szijjarto at the UN General Assembly session in New York.